GATTACA getting developed into a futuristic CSI? Variety is reporting some odd news today. It seems that Denis Learyâ€™s production company, Apostle Films (Rescue Me) have bought the rights to turn one of our favorite scifi films, GATTACA, into a one-hour police procedural television drama. The man in charge of pushing the pen is Gil Grant, who besides a few episodes of 24, doesn't have much experience as a showrunner. I don't want to sound like a spoil sport or anything, but a GATTACA television show that's seen from the point of view of cops doesn't sit well with me. 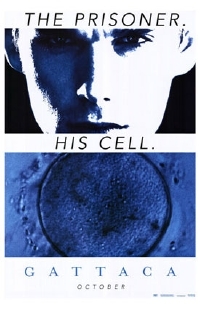 The world of GATTACA is dystopian, where the cops are the enforcers of outrageous discriminations based on genetics. They seek out "invalids" (or those people trying to pass as genetically superior) and essentially destroy them. Seems to me, the company has bought a sellable name rather than a story they intend to be true to. Another thing to note, is just how few of these movie-to-tv projects actually seem to get past the pilot stage. I mean, whatever happened to that Children of Men tv show anyway? Main character investigator will secretly be an invalid, or something happens to make him sympathize and aid invalids, or something like that. Seems obvious to me. There has to be 20 CSI type shows already out and I hate them all. I doubt this will fair any different. I would however like to see a sequel to Gattaca. Then again, a long time back some guys thought it would be a good idea to make a TV series out of the movie "Total Recall," which didn't sound like it would be a good idea at all...and then it turned out that they had secretly made "Blade Runner: The TV Series" instead, and that worked out okay. I mean, not SUCCESSFUL okay by TV standards, but okay enough to get a few seasons out. Making a show that owes only its title to a feature film doesn't necessarily have to be a bad thing. I really despise all those CSI and Law and Order shows. I always thought 24 was flat out tasteless.